Most women love to look good, and it is my passion to help bring out their assets and personalities using fashion. The holiday season is filled with all types of parties, and finding the right attire can be confusing. Here are some suggestions for looking great at any event. You’ve decked your halls and invited friends over to be jolly. My advice? A trendy blend of casual and festive. Here, Meridith is wearing a bare shoulder dressed-up T-shirt – part of her own Maniac collection – with emerald green suede leggings, over the knee boots (a must have!) and an oversized necklace to pull it all together. Meridith Casey, is the founder of Dallas-based company, Maniac, which gives 100% of net profits to Dallas’ Child and Family Guidance Center – an organization that has provided counseling and treatment to those in need for over 100 years. Armed with a business degree from the University of Georgia and a love of fashion, Meridith’s life took a turn when her adult brother was diagnosed with bipolar disorder three years ago. “Maniac is the merger of my passion for casual, comfortable, stylish clothing with my compassion for my brother and those like him,” she says. Swap the over the knee boots for a dressy ankle strap shoe and throw on a statement faux fur jacket and a gold chain purse to turn heads at a fancier fete. Fab! It’s a season of philanthropy and fashion. For a sophisticated daytime look, I put Laurie in an A-Line bright blue (blue is the new black!) shift dress topped with a deconstructed winter white blazer and this season’s must have suede booties. 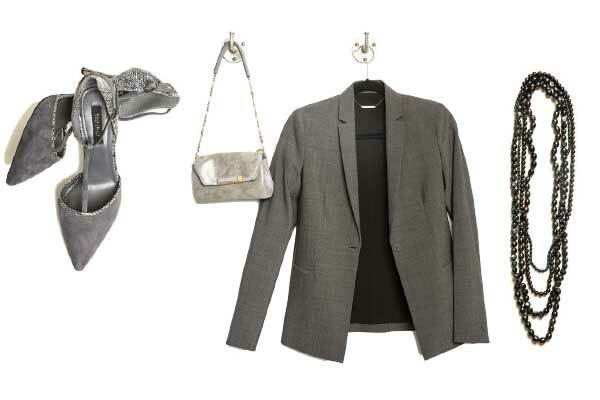 To transition to her 3:00 p.m. office party, Laurie could add this long strand of black pearls, streamlined heather grey blazer, suede pointy toe pumps. Don’t forget to toss a red lipstick into this timeless handbag. Ooh la la! Modeled here by Radhika is a perfect combination of professional yet chic. She’s wearing a jacquard high-low full skirt, classic silk black top, strappy suede pumps (tis’ the season for jewel tones! ), and a custom-designed horn necklace. To meet her girlfriends for a holiday gift exchange, Radhika slips on this season’s must-have flared jeans, an embellished saddle bag, and the “new neutral”−burgundy platform heels. The jeweled earrings complete her look. Tres Chic! For Kim I selected an elegant sheath dress with a crisscross undergarment that gives it an edge. The simplicity is timeless. Having more than one event on one night is common during the holiday season. For a quick change from fancy to understated, Kim can top off her dress with a blazer, an eye catching belt, closed toe shoes and a structured handbag. Looking good! Fashions styled by Amy Levenson Krumholz – StylebyAmy.com.